When the entertainment area of the home needs a simple and functional wet bar installed, the soft lines and elegant finish of the MR Direct 1512 bar sink could be the perfect fit. The size and curves of this undermount model make it the right choice especially when space is at a premium. As well as providing an adequate washing area for glassware and utensils at the bar, it can also offer just the right amount of space to clean vegetables and foodstuffs when installed as a prep sink in the kitchen. It is constructed from a single piece of premium, 304-grade, cold rolled steel, using a die and pressure to extrude its unique shape. At a full 18-gauge thickness, which is the industry standard, it will more than adequately resist accidental dents, or any vibrations from disposal use. The visible steel surface is given a brushed-Satin Finish which adds to its luster and masks minor scratches which could occur over time. Dense, sound-dampening pads and an insulation coating are applied to its underside. With an overall measurement of 1512, it will require a minimum-width cabinet of 15". It is cUPC certified. This ensemble includes our custom-fitted, natural cutting board made from the dense hardwood of the rubberwood tree. Naturally resistant to moisture and mold; it features a groove along its perimeter which channels away any runoff. 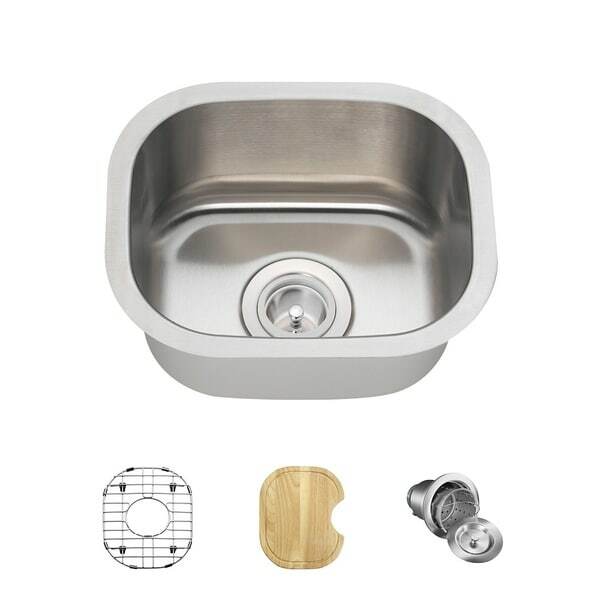 Our high-quality stainless steel grid is custom-made to fit this basin. It helps protect the surface from scratches and dents, and prevents water from contaminating food. Its removable rubber feet raise it slightly above the bottom of the sink. Our basket strainer offers a deep, perforated, metal basket, complete with handle. It sits inside the main body and holds considerably more waste than standard models.